An iconic scene during the Portuguese arrival in Malabar in 1498 is when the ex-convict Joao Nunes stepped into land and met two Moors from Tunis. The Moors greeted the ex-convict, “The Devil take you! What bought you here.” He replied, “We came to seek Christians and spices”. While the Portuguese search for a direct trade route to India bypassing the Muslims is well known, less mentioned is this search for Christians. They searched for the Eastern Christians in Africa and India and interestingly found them everywhere they looked. They also encountered Muslims; encounters which did not go well. The joyous news of the discovery of Eastern Christians was duly reported to Dom Manuel. Vasco da Gama’s king, Dom Manuel, over a period had developed a messianic streak, due to the death of a large number of people who had preceded him. He believed that he was chosen by the Holy Spirit to confront the powerful. He wanted to take over the Holy Land and destroy Mecca to claim the title — the Emperor of the East. But he could not do it alone: to attack the Egyptian Mamluks, for instance, he needed help and for this the lost Christian kingdoms of Asia could become useful. To understand this Portuguese obsession with finding Eastern Christians, we need to go along with Vasco da Gama on his first Voyage to Malabar and experience his encounters with people of other faiths. After navigating the Cape, the fleet reached Mozambique Island in March 1498 where men belonging to the “sect of Mohammed” told them that Eastern Christians lived on a nearby island. The other half of the island where the Christians lived was populated by Moors and there were constant battles among them. Then they were told that Prester John — the mythical Christian king — lived nearby in the interior and he could be reached by a camel trip. 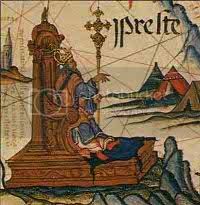 Though they were happy to hear about Prester John, they did not attempt to visit him. During a conversation, the Sultan of Mozambique asked Nicolau Coelho, one of the captains in Gama’s fleet, about Turkey and their religious books. Then Coelho realized that the Sultan had assumed them to be Turks and not Christians. The Portuguese wanted to conceal their identity since they did not know how the reaction would be. Hence for celebrating mass, they would go off to an island. That did not work very well and the Sultan came to know who they were. By then a rumor spread that the Portuguese would be killed. They fled, but like in a cartoon film, the wind bought them back to Mozambique. Surprisingly the Sultan did not want to kill them but wanted to befriend them. He sent a sharif and his young son aboard. The relation between the Portuguese and the Muslims took another U turn. A search for fresh water resulted in an irritated Gama who fired bombards around — at the people who were guarding the fresh water, at the main settlement — and left. After a brief search for the Christian island, they left for Mombasa, where the pilots who were from Mozambique assured them that they would be well treated by the Christians. But the promised red carpet welcome in Mombasa did not happen. A large number of people tried to board Gama’s ship which he disallowed; he even prevented two people who said they were Christians since he did not believe them. Finally two expendable convicts, like Joao Nunes, were sent on shore. They went to some Christian homes where they saw some books mentioning the Holy Spirit. Then again the relation turned sour: from Portuguese accounts, it was Christians against Muslim dogs. They also reported that Christian merchants were being held prisoners by the Muslim king. After Mozambique Island and Mombasa, the next stop was Malindi in Kenya where Gama had heard that there were Christian ships in the port and he could get Christian pilots. There were indeed four ships in the harbor. They had some “Indian Christians” too – people who worshipped Christian icons, but did not eat beef. This delusion continued in Kerala: every non-Muslim was considered to be a Christian; every unfamiliar icon was a Christian one. For them Calicut was inhabited by Christians: Christians who wore tufts on their head. On their way to meet the Zamorin Manivikraman Raja, they stopped by a “church”. In front of this “church” which was built of stones and tiles, there was a bronze pillar with a bird carved on the top. Inside was a small image of “Our Lady”. The priest who wore a thread over his shoulder gave them holy water and ash which the Portuguese assumed to be a deviant Eastern custom. When he finally met Manivikraman Raja, Gama was asked for the reason for his visit and he spun a tall tale. Gama said Dom Manuel was quite rich with enough gold and silver that he did not need anything. Gama had come searching for Christian kings and he was desperate to find one since his life depended on it. The Muslim problem resurfaced again: After the meeting the Zamorin asked Gama if he wanted to spend the night in a Christian house or a Muslim one. Gama wanted neither, but due to the monsoons he had to settle down in a Muslim house. Few days later, Gama met the Zamorin again and gave him copies of a letter: one letter was in Portuguese, which no one could read and the other was in Arabic. Gama did not want a Muslim to read the Arabic letter and demanded a Christian. They found an Arabic speaking Christian, but he could not read. Finally the Muslims had to read it. By the end of May tensions again rose between the Portuguese, Muslims, and the authorities in Calicut. The Portuguese suspected that the Muslims in the court were against them. The locals suspected that the Portuguese would flee without paying the port duties of 600 ashrafis. Muslim merchants would spit when the Portuguese went by. One night, fearing an attack, the Portuguese took turns keeping watch. Then like the incident in Mozambique Island, the attack never happened. But once again tensions rose regarding the port duties: One of the Portuguese crew men, Diogo Dias, was detained and his goods captured. On hearing this Gama wondered how a Christian King — the Zamorin — could show such dog like behavior. Maybe the merchants of Mecca had influenced him. 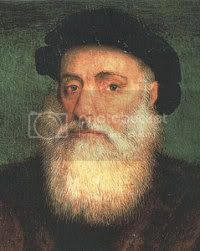 Once again, like in Mozambique Island, a rumor spread that Vasco da Gama would be killed. That issue was also resolved without bloodshed even though there was hostage taking and threats of beheading by the Portuguese. Around 28th August, Gama’s fleet left and due to slow winds reached the South Kanara Coast where the fishermen whom they met were ‘Christians’. By the 19th September, they reached some islands near Goa. Only after one of the natives assured them that he was a Christian only then did they set foot on the land. Following Gama’s return to Lisbon, his ex cathedra pronouncements of the East spread in Europe. In a letter written by a Florentine merchant it is mentioned that Malindi was populated by Christians and Gama had found the fabled Christian kings of the East. India had a large Christian population as well. While Eastern myths created the imaginary Prester John, the story of Gama’s Eastern Christians fed into that myth and created new ones. One of the passengers on Gama’s ship was a Jew — Gaspar da Gama — who provided details of the Christian kings and the size of the armies. According to Gaspar, in areas which did not have Christian kings, the Moors ruled over Christians. This Jew had lived in India for more than two decades and why would he come up with this false representation of India.? The Gujarati pilot who helped Gama and the Tunisian Muslim who came along with Gama knew India very well. Still why would this myth persist that India had Christian kings? One probable reason is that the Portuguese were unfamiliar with Hindus. In their world there were Muslims and Jews. For them anyone who was not a Muslim was by default a Christian even though they did not celebrate mass or worshiped strange looking gods or had unseen customs. People like Gaspar da Gama went along with this myth for a while. Then one day Gaspar himself burst the bubble. But the clarification did not matter for Dom Manuel continued to believe that the Zamorin was an imperfect Christian. The next voyage in 1500, led by Pedro Cabral, carried a letter to the Zamorin containing eschatological references. There were also priests on board to teach the true faith to the people of India. This Portuguese experience of India — that Indians were deviant Christians — did not die soon and persisted among Europeans till the 19th century. Charles Grant, the man who invented the word “Hindooism” thought Brahmins were the descendants of Noah and were blessed in the Garden of Eden. These Brahmins who once held belief in a rational Supreme Being, had now fallen from grace into the ignorant ways of polytheism and idolatry. Jean-Antoine Dubois, a French-Catholic missionary, who spent time in Pondicherry, Madras Presidency and Mysore from 1792 to 1823 argued that Brahmins were descendants of Magog’s father Japheth. Many Indologists of the 19th century, who came up with the Aryan race theory, too worked within this Biblical framework. Sanjay Subrahmanyam, The Career and Legend of Vasco da Gama (Cambridge University Press, 1998). Alvaro Velho and Joao de Sa, A journal of the first voyage of Vasco da Gama, 1497-1499 (Printed for the Hakluyt Society, 1898). Most of these accounts come from Portuguese sources and hence it is just one side of the story. Thanks to Maddy for general enlightenment about this story. Whats the link between monsoons and Muslim houses? That night Gama was returning back and due to heavy rains, he could not proceed further. He had to take refuge in the nearest house.